The Dow, Nasdaq and Russell all posted gains for the fifth consecutive week. The S&P failed to post a gain with a six-point loss for the week. The other indexes posted only miniscule gains. The key point here is that the markets fought back from an early week bout of volatility to close flat for the week. That maintains the streak and the rally remains intact ahead of tech earnings next week. Check the graphic below for any new stop losses in bright yellow. We need to always be prepared for an unexpected decline. Check the graphic below for any profit stops in green. We need to always be prepared for a profit exit at resistance. Full updates on all plays on Wednesday and Saturday. Only closed plays are updated on other days. Intel crashed on its revenue miss and AMD soared to a 2-month high on expectations for rising market share. Original Trade Description: Dec 22nd. 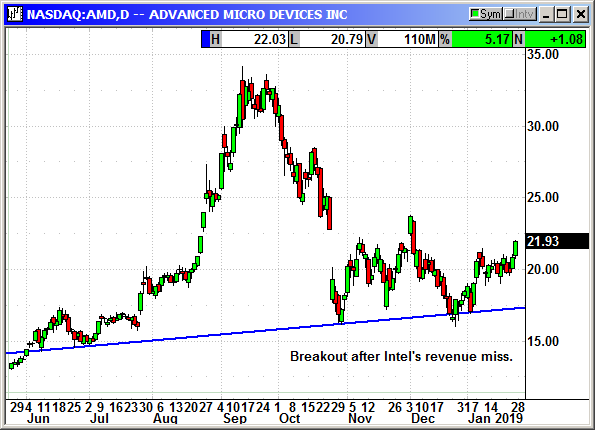 Advanced Micro Devices, Inc. operates as a semiconductor company worldwide. It operates in two segments, Computing and Graphics; and Enterprise, Embedded and Semi-Custom. The company's products include x86 microprocessors as an accelerated processing unit (APU), chipsets, discrete and integrated graphics processing units (GPUs), and professional GPUs; and server and embedded processors, and semi-custom System-on-Chip (SoC) products and technology for game consoles. It provides x86 microprocessors for desktop PCs under the AMD Ryzen, AMD Ryzen Pro, Threadripper, AMD A-Series, AMD E-Series, AMD FX CPU, AMD Athlon CPU and APU, AMD Sempron APU and CPU, and AMD Pro A-Series APU brands; microprocessors for notebook and 2-in-1s under the AMD Ryzen processors with Radeon Vega GPUs, AMD A-Series, AMD E-Series, AMD C-Series, AMD Z-Series, AMD FX APU, AMD Phenom, AMD Athlon CPU and APU, AMD Turion, and AMD Sempron APU and CPU brands; and microprocessors for servers under the AMD EPYC and AMD Opteron brands. It also offers chipsets under the AMD brand; discrete GPUs for desktop and notebook PCs under the AMD Radeon and AMD Embedded Radeon brand; professional graphic products under the AMD Radeon Pro and AMD FirePro brands; and customer-specific solutions based on AMD's CPU, GPU, and multi-media technologies. In addition, it provides embedded processor solutions for interactive digital signage, casino gaming, and medical imaging under the AMD Opteron, AMD Athlon, AMD Sempron, AMD Geode, AMD R-Series, G-Series, and AMD Embedded Radeon brands; consumer graphics under the AMD Radeon brand; and semi-custom SoC products. It serves original equipment and design manufacturers, datacenters, system integrators, distributors, and add-in-board manufacturers through its direct sales force, independent distributors, and sales representatives. Advanced Micro Devices, Inc. was founded in 1969 and is headquartered in Santa Clara, California. Company description from FinViz.com. AMD was always the red-headed stepchild that Intel kept around to prevent Intel from being called a monopoly. They let them have just enough business to keep them going. After decades of picking up Intel's scraps, the company has finally come of age and has announced multiple processor families that are more technological advanced than Intel's chips and they are 12-18 months ahead of Intel's first foray into this level of manufacturing. Cloud operators are taking notice of the faster, cooler, cheaper processors and this sector buys hardware by the truckload. AMD is stealing market share from Intel and this is likely to accelerate as these new processor families flood the market before Intel can catch up. 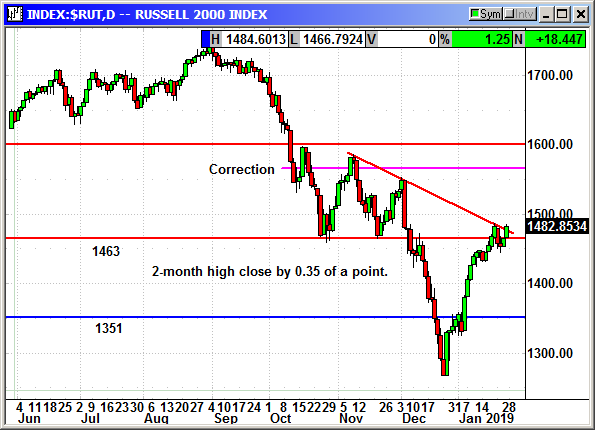 Over the last two weeks of Nasdaq decline, AMD pulled back to uptrend support and could be ready to rebound sharply if the market cooperates. Update 1/10: AMD's president and CEO, Dr Lisa Su, gave the keynote address at CES 2019 on Thursday. She announced the fastest GPU video card they have ever produced running on a 7nm process. The card has 60 compute units, 3840 stream processors, 16gb of ultra-fast HBM2 memory with a 1 TB memory bandwidth for stunning high speed graphics on 4K and 8K monitors. Shares popped at the open but faded in the afternoon. 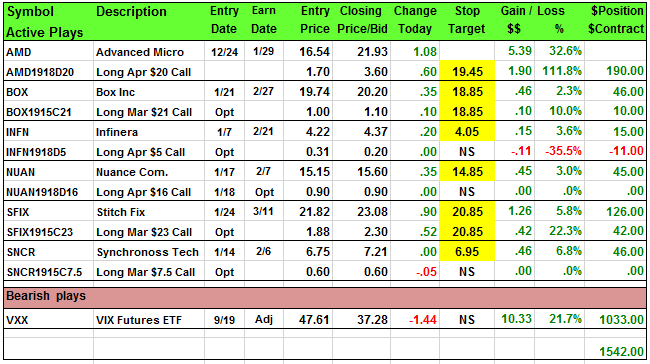 Long April $20 Call @ $1.70, see portfolio graphic for stop loss. No specific news. 2% rally to a 4-month high. Original Trade Description: Jan 19th. Box, Inc. provides cloud content management platform that enables organizations of various sizes to manage and share their enterprise content from anywhere or any device. The company's Software-as-a-Service platform enables users to collaborate on content internally and with external parties, automate content-driven business processes, develop custom applications, and implement data protection, security, and compliance features. Box, Inc. offers its solution in 23 languages. It serves healthcare and life sciences, financial services, legal services, media and entertainment, retail, education, and energy industries, as well as government sector primarily in the United States. The company was formerly known as Box.net, Inc. and changed its name to Box, Inc. in November 2011. Box, Inc. was founded in 2005 and is headquartered in Redwood City, California. Company description from FinViz.com. Box is a provider of cloud content management services to enterprise customers. Procter & Gamble and GE are two of its largest customers. Over the last several weeks there has been a persistent rumor they will be acquired. Google has been a rumored acquirer but it is more likely Microsoft or even Hewlett Packard could be interested. Entering a position on acquisition rumors is rarely a good move. More than 90% of the time nothing happens. In this case revenue is growing in excess of 25% for 2018 and they guided for 20%+ for 2019. They also guided for their first quarterly profit in Q4 since they went public in 2015. Their customer retention rate is close to 100% and they had more than 90,000 customers at the end of Q3. Box has enough scale that it makes sense to be acquired rather than a large company trying to replicate their product and service and spend years stealing market share. Buying Box now would be an instant add on to profits. 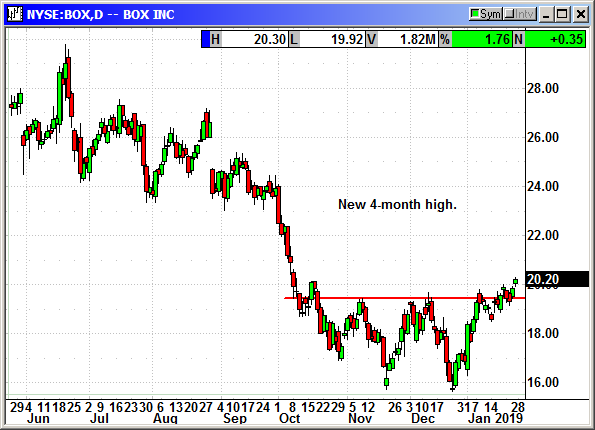 Shares broke over three-month resistance on Friday and the next material level is $24. Long BOX Shares @ $19.74, see portfolio graphic for stop loss. Optional: Long March $21 Call @ $1.00, see portfolio graphic for stop loss. Shares posted a 5% gain on Friday on no news. Original Trade Description: Jan 5th. Infinera Corporation provides optical transport networking solutions, equipment, and software and services worldwide. The company's product portfolio consists of Infinera DTN-X Family of terabit-class transport network platforms, including the XTC Series, XTS Series, and XT Series; Infinera DTN-X XTC series multi-terabit packet optical transport platforms that integrate digital OTN switching and optical WDM transmission; and Infinera DTN-X XT series for terrestrial applications and XTS series for subsea applications. It also provides Infinera XTM Series packet-optical transport platform that enables high-performance metro networks with service-aware, application-specific capabilities; and Infinera Cloud Xpress Family designed to meet the varying needs of ICPs, communication service providers, Internet exchange service providers, enterprises, and other large-scale data center operators. In addition, the company offers Infinera FlexILS open line system platform that connects various Infinera and third-party terminal equipment platforms over long-distance fiber optic cable providing switching, multiplexing, amplification, and management channels. Further, it provides software solutions, including Xceed Software Suite that address long-haul, subsea, and metro networks, as well as a range of support services for all hardware and software products. The company also serves telecommunications service providers, Internet content providers, cable providers, wholesale and enterprise carriers, research and education institutions, enterprise customers, and government entities. It markets and sells its products and related support services primarily through its direct sales force. The company was formerly known as Zepton Networks. Infinera Corporation was founded in 2000 and is headquartered in Sunnyvale, California. Company description from FinViz.com. Infinera is a global supplier of terabyte speed network equipment. They are in nearly every country. Their products handle long haul data transmission even in undersea links. Shares collapsed back in early November when they reported earnings. The CEO said the company had seen a pause in sales as buyers evaluated the combined company. They had just purchased Coriant. The CEO said revenue in Q4 would increase by 50% because of the acquisition but they would post a bigger loss on acquisition expenses. For Q3 they lost 4 cents and analysts were expecting a 5-cent loss. The guidance for Q4 was a loss of 26-30 cents because of the acquisition. Shares fell to $3.50 post earnings. Over the last week they have recovered to $4.25 and appear to be accelerating higher. Resistance is $5. This is not a fast mover, but all the bad news is now priced into the stock. Readers have been requesting more low dollar stock recommendations and this would fit that scenario. Update 1/10: The Australia to Japan undersea cable completed a major upgrade of the 12,700 kilometer cable system using Infinera ICE4 devices allowing multi terabit capacity. 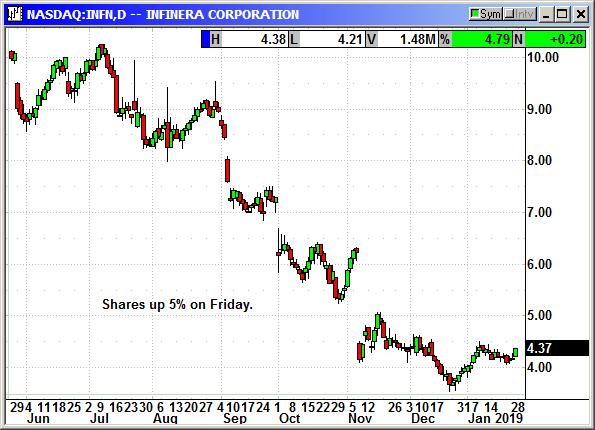 Long INFN shares @ $4.22, stop loss $3.75. Optional: Long April $5 Call @ 31 cents, no stop loss. No specific news. Earnings date changed to February 7th. Original Trade Description: Jan 16th. Nuance Communications, Inc. provides voice recognition and natural language understanding solutions worldwide. It operates through five segments: Healthcare, Automotive, Enterprise, Imaging, and Other. The Healthcare segment offers clinical speech and clinical language understanding solutions, such as Dragon Medical, a dictation software that allow physicians to capture and document patient care in real-time; transcription solutions, which enable physicians to streamline clinical documentation with a transcription platforms; clinical document improvement and coding solutions; diagnostic solutions that allow radiologists to document, collaborate, and share medical images and reports; and professional and personal productivity solutions to business users and consumers. The Automotive segment provides branded and personalized virtual assistants and connected car services for automotive manufacturers and their suppliers. The Enterprise segment offers On-Premise solutions and services, an automated customer service solution that comprise automated speech recognition, voice biometrics, transcription, text-to-speech, and dialog and analytics products; and On-Demand multichannel cloud, a platform, which offers enterprises the ability to implement automatic customer service. The Imaging segment provides multi-function printer (MFP) scanning and document management solutions; MFP printing and document management solutions to capture and automate paper to digital work flows; and PDF and OCR software for capturing, creation, and management of document work flows. The Other segment offers voicemail transcription and other value-added services to mobile operators; and speech recognition solutions and predictive text technologies for handset devices. The company was formerly known as ScanSoft, Inc. and changed its name to Nuance Communications, Inc. in October 2005. Nuance Communications, Inc. was founded in 1992 and is headquartered in Burlington, Massachusetts. Company description from FinViz.com. Multiple positive headlines over the last three weeks plus an appearance at the JP Morgan healthcare conference last week has brought new life to Nuance. In mid November the company announced the spinoff of its automotive unit and shares tanked in an already down market. The spinoff will be completed before the end of 2019 so it is not anything that should impact price today. Their expertise in voice recognition software is being married with a new AI background to bring this technology to a wide range of applications. Organic revenue rose 12%. Shares have rebounded from $12.50 to $15.20 in three weeks and could easily retest their November highs near $18 on the new business applications. Fund managers are looking for beaten down small cap stocks as we move into 2019. Buy NUAN shares, currently $15.20, see portfolio graphic for stop loss. Optional: Long Apr $16 call @ 90 cents, see portfolio graphic for stop loss. No specific news. 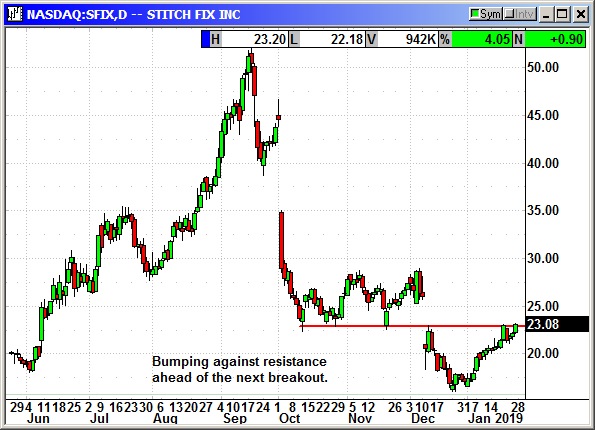 A fractional close over resistance at $23. One more positive day should do it. Original Trade Description: Jan 23rd. Stitch Fix, Inc. sells a range of apparel, shoes, and accessories through its Website and mobile app in the United States. It offers denim, dresses, blouses, skirts, shoes, jewelry, and handbags for men, women, and kids under the Stitch Fix brand. The company was formerly known as rack habit inc. and changed its name to Stitch Fix, Inc. in October 2011. Stitch Fix, Inc. was founded in 2011 and is headquartered in San Francisco, California. Company description from FinViz.com. Stitch posted Q3 earnings in early December of 10 cents compared to estimates for 3 cents. Revenue rose from $295.6 million to $366.2 million and beat estimates for $358 million. They guided for Q4 for revenue of $360-$368 million. Analysts were expecting $363 million. Shares sank because the expected growth was nearly flat. The company said it was changing its focus to quality long term customers rather than short term customers that are more costly. This is a great move but short sighted investors sold the stock. They want to move away from customers that continually return everything in their box creating headaches for the company. They want to keep customers that actually buy some or all of the items in their box because that generates the profits. They don't want to add customers at a breakneck speed just to please analysts. Shares rebounded from the December earnings drop and market crash to a two-month high on Friday. This week has seen a pullback, which could be an entry point. Long SFIX shares @ $21.82, see portfolio graphic for stop loss. Optional: Long March $23 call @ $1.88, see portfolio graphic for stop loss. No specific news. Prior resistance is now support. Synchronoss Technologies, Inc. provides cloud, digital, messaging, and Internet of things platforms, products, and solutions worldwide. Its products and services include cloud-based sync, backup, storage and content engagement capabilities, broadband connectivity solutions, analytics, white label messaging, and identity/access management that enable communications service providers, cable operators/multi-services operators, original equipment manufacturers with embedded connectivity, and multi-channel retailers, as well as other customers to accelerate and monetize value-add services for secure and broadband networks and connected devices. The company also provides Synchronoss Enterprise solutions, such as secure mobility management, data and analytics, and identity and access management solutions for the financial, healthcare, and life sciences markets; and Synchronoss Personal Cloud platform that delivers an operator-branded experience for subscribers to backup, restore, synchronize, and share their personal content across smartphones, tablets, computers, and other connected devices. Its products and platforms are designed to enable multiple converged communication services to manage across a range of distribution channels, such as e-commerce, m-commerce, telesales, customer stores, indirect, and other retail outlets. The company markets and sells its services through direct sales force and strategic partners. Synchronoss Technologies, Inc. was founded in 2000 and is headquartered in Bridgewater, New Jersey. Company description from FinViz.com. At CES 2019, Synchronoss Technologies announced a partnership with TBCASoft to redefine telecom operators with a blockchain payment processing system. This will allow users to make instore payments, mobile and digital purchases directly from their phones using the Synchronoss secure-multichannel communications platform. Payments can be made vis SMS, email and rich communications services (RCS) leveraging the TBCASoft cross-carrier blockchain payment system. Synchronoss plans to leverage distributed ledger technology to remove middlemen parties typically found in other payment ecosystems. Shares rose 20% over the last 10 days as the news surrounding CES became known in the investor marketplace. The stock is on the verge of a breakout to a seven-month high. 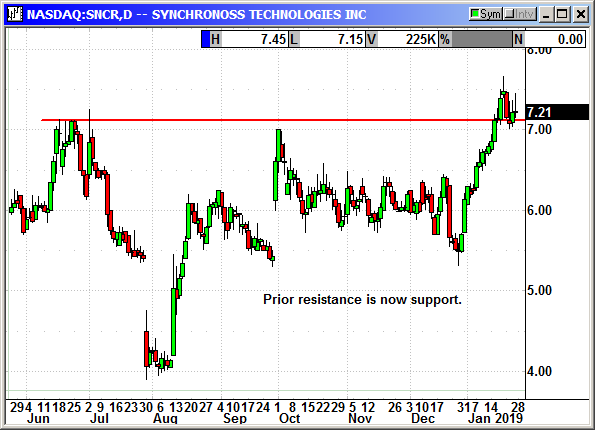 Long SNCR shares @ $6.75, see portfolio graphic for stop loss. Long March $7.50 call @ 60 cents, see portfolio graphic for stop loss. Excellent drop ahead of the weekend. Futures decay over the weekend should help. The VXX will eventually be single digits but it could be months in the future. Previously: Earlier this year, a reader emailed me saying a friend was short 1,000 shares. When the $21 spike came in afterhours, Ameritrade closed that position for a $35,000 loss. They did not have a protective stop loss. I wrote in the prior newsletter that we were not using a profit stop in this position because it could be hard to re-short the shares after a volatility event. That is just trade management for a profitable position. In ANY SHORT POSITION, you should have a catastrophe stop loss to avoid the position turning into a major loss. Had this person had a stop loss at their entry point, they would have been closed for a breakeven and they would be sleeping a lot better tonight. As evidence of this flaw, they have now done four 1:4 reverse stock splits. The last five reverse splits occurred at $13.11 (11/2010), $8.77 (10/2012), $12.84 (11/2013), $9.52 (8/8/16), $12.77 (8/22/17). The prospectus says it can reverse split anytime it trades under $25 for a prolonged period and the splits will always be 1:4. We know from experience that the VXX always declines. The last two times we shorted this ETF we had a $7.23 and $5.98 gain. Unfortunately, put options are expensive with a volatility instrument at this price level. The only recommendation is to short the ETF and forget it. 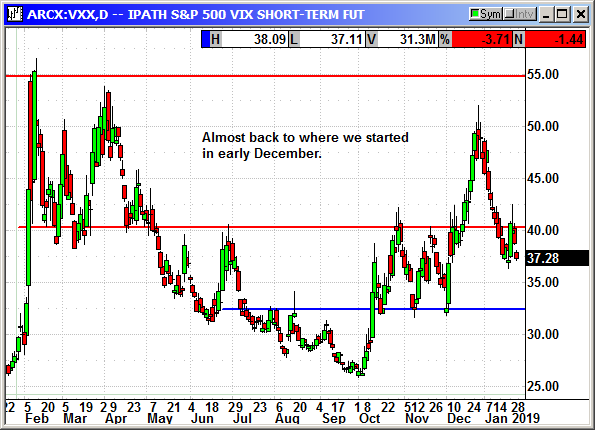 If we do get a prolonged rally into year-end we could see a sharp decline in the VXX over the next 2-3 months. This will be a long-term position. This is not a 2-3 week play. I can guarantee you, if history holds, we can play this until it splits 1:4 again at $10. Once we are in the position and profitable I will put a trailing stop loss on it. We will take profits and then look for a bounce to get back in. The VXX is hard to short. Shortsqueeze.com says there are 19.9 million shares short out of 26.7 million shares outstanding. The shares are out there and being traded because the volume on Monday was 29.6 million. You have to tell your broker you really want to short it and make them find the shares. Sometimes it takes days or even a week before your broker will find you the shares. Trust me, be persistent and it will be worth the effort. I had held off after the 1:4 reverse split because the options were expensive and I was expecting volatility in September from the budget battle and debt ceiling hurdle. 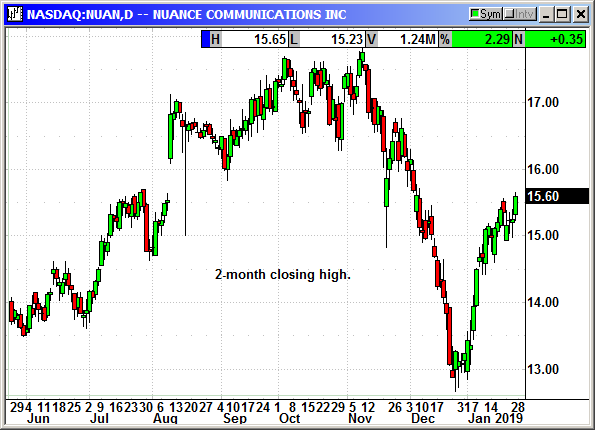 With those issues pushed out into December, the volatility is dropping like the proverbial rock. Several readers have already emailed me asking when I was going to put this position back in the portfolio. Short VXX shares @ $40.95, see portfolio graphic for stop loss. Short VXX shares @ $54.27, see portfolio graphic for stop loss. If you like the trade setups you have been receiving and you are on a free trial then now is the time to subscribe. Do not wait until you miss a newsletter to decide you want to take the plunge.